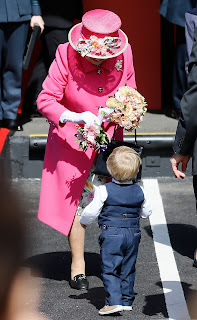 Queen meets toddler who's a dead ringer for her grandson Prince George(photos) - BlogIT with OLIVIA!!! Despite being about a year younger than his doppelganger, little Charlie Capper is the spitting image of the monarch’s grandson Prince George. 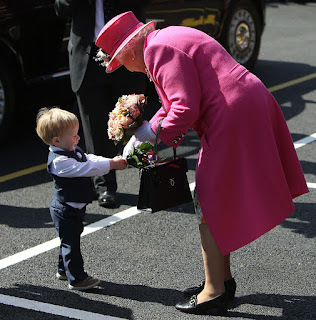 Dressed in his best waistcoat, shirt and trousers, the 18-month-old toddler grinned up at Her Maj as he handed her a bunch of flowers for her birthday. He is one of the youngest kids ever to have met the Queen after being brought along to the Royal Mail delivery office by his granddad, who has completed 50 years with the service.